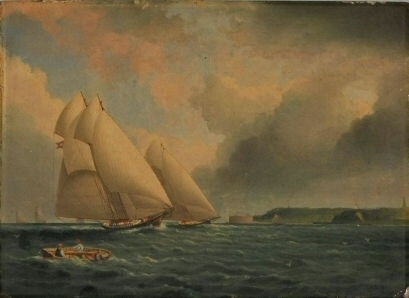 Artifacts documenting the maritime history of New York have been a vital part of the Museum’s collection since its inception, a natural result of the city’s water-bound geography. 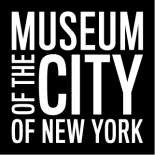 In 1953, the Marine Museum of New York merged with MCNY, greatly expanding the marine material in the collection. 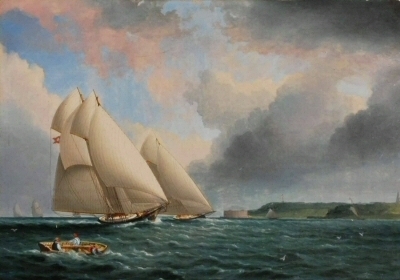 Included in this diverse collection are portraits of commercial ships, riverboats, racing yachts, and pleasure crafts as well as port, harbor, ocean, and river views from the 18th to the 20th century. Since 2009, the Museum has undertaken a project to conserve more than 50 of its most important marine paintings. This project was made possible through generous support from the J. Aron Charitable Foundation and the National Endowment of the Humanities. Carolyn Tomkiewicz, formerly a conservator at the Brooklyn Museum and now in private practice, and Thomas Branchick, director of Williamstown Art Conservation Center, have carried out the hands-on work to restore these paintings to their former glory. Below are examples of “before” and “after” states of paintings in the collection that have undergone treatments to stabilize, preserve, and protect these important historical works. Such treatments include removing dirt, grime, discolored varnish, and over-paint, as well as re-aligning tears, in-painting damages, reducing craquelure, and reinforcing tacking margins on brittle canvases. 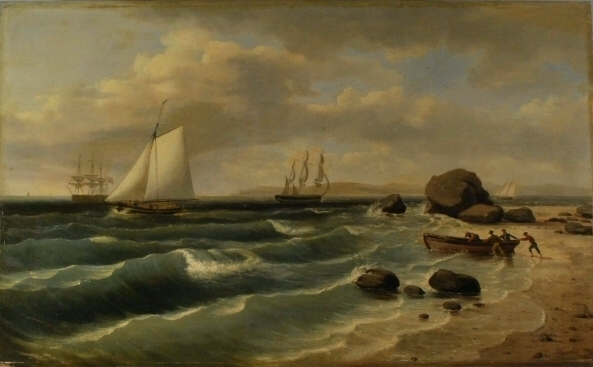 Almost every finished painting, including this work by Thomas Birch, is treated with a coat of translucent varnish that serves to protect the paint layer from the atmospheric effects of moisture, dust, and sunlight. After years of exposure to these elements, the varnish eventually yellows and darkens, thus obscuring the artist’s original color palette. One of the primary roles of a conservator is to remove the murky, discolored varnish and replace it with a fresh layer of varnish. The effect of this process can be seen in the noticeably brighter “after” versions of these paintings. 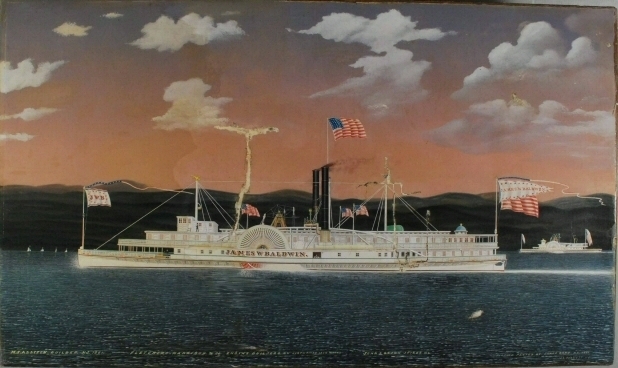 James Bard’s portrait of the steamboat “James W. Baldwin” came into the Museum’s collection with two complex tears (seen to the left and right of the central smokestacks in the “before” image.) Conservator Carolyn Tomkeiwicz carefully stabilized the tears and mended them from the reverse side of the canvas with woven canvas fibers and protective patches. She then applied an undercoat of gesso to the areas around the tears and carefully in-painted to integrate the damages into the composition. 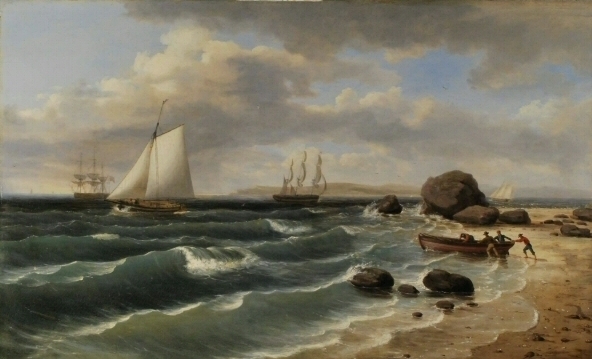 Highlights from the collection include works by James Bard, Fitz Henry Lane, Edward Moran, Anthony Imbert, Fred Pansing, James Buttersworth, Antonio Jacobsen, and Thomas Birch. Due to the Museum’s conservation efforts, many of these paintings are now on public view for the first time in generations. Visit the Museum’s third floor to see a selection of treasures from the marine painting collection in their fully conserved states. 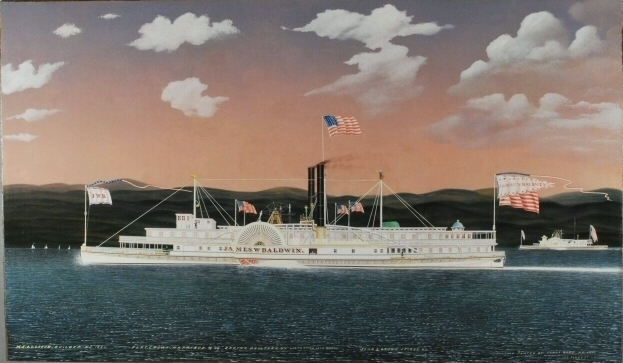 This entry was posted on March 5, 2013 by sdanhakl in Paintings and tagged 19th century, 19th-century art, albany, Bard, Beaches, boats, Buttersworth, conservation, East River, flags, Fort Wadsworth, harbor, hudson, hudson river, J. Aron Charitable Foundation, James Bard, james buttersworth, Marine, marine art, marine collection, marine conservation, marine painting, National Endowment of the Humanities, New York Harbor, new york marine artists, ocean liners, ocean vessels, ocean views, river, river boat portraits, river boats, river vessels, sandy hook, seascapes, ship portraits, Shipping, Ships, side wheel steamer, sporting vessels, Staten Island, thomas birch, waterscapes, yacht race, yachts.